Tiny with a lot of features. If never really liked small mice but the M20 really changed that. The mouse is very comfortable, even though it doesn’t have a palm rest. 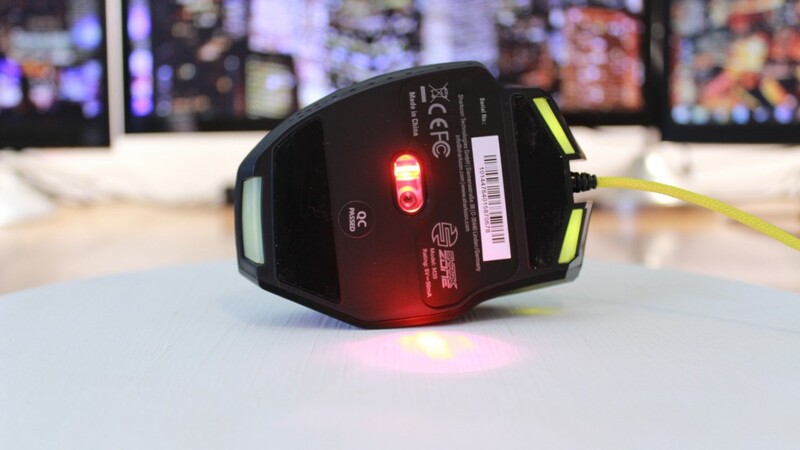 The mouse does have a lot of yellow illuminated areas though, the scroll wheel, beneath the 2 mouse buttons, at the back and the LED indicators. The mouse also only costs $25 which is a very good price. The thumb rest I really liked, your thumb fits perfectly into the space. The thumb rest has 4 buttons, 2 at the top and 2 at the back. The top 2 is a bit higher than what I would have wanted but not to high so that it’s uncomfortable. The back 2 is a very feature, most of the time I used the middle of my thumb to press them but you are able to press them normally as well. The right and left mouse button has a satisfying click, not to heavy or to light. The scroll wheel is illuminated and has a nice rubber grip that prevents any slip. Just below the scroll wheel sits a big yellow DPI button. The button switches between 4 DPI levels, 400, 800, 1 600 and 3 200. There are 4 LED DPI indicators on the left side just in front of the top thumb buttons that will let you know on what DPI level you are on. On the right side is another mouse button that looks like a smaller right mouse button. It doubles as a ring finger rest as well and it’s pretty comfortable. This makes it very easy to click while gaming. Just behind the right-right mouse button sits a long yellow “press” button. Can you think what this does? 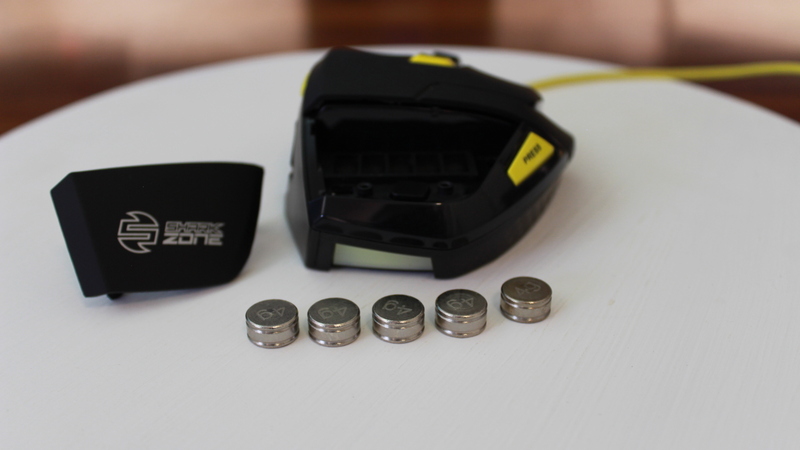 Well it pops of the back of the mouse to show five 4gram weights, this allows you to make the mouse weigh anywhere between 80grams and a 100grams (without cable). This is always a nice feature to have, even though personally I never adjust the weight of my mouse. Underneath the mouse sits a PixArt PAW3305DK optical sensor which is very nice. It has a lift-off distance of 3 mm and a max polling rate of 1 000. Also beneath the mouse is a very large mouse feet that allows you to move across a surface very smoothly. The cable is a 1.8 meter (5.9 feet) braided cable with a gold plated USB connector. Then lastly there is the software that you can download from Sharkoons website or install off the included CD. The software is pretty straight forward, you can assign a command to any button on the mouse and lighting options (only yellow though). You can also do some change some more advanced features like double click speed, scroll speed and X-Y Axis sensitivity. I was really not expecting to like the M20 this much. At first the small size threw me off but after using it for a while, I really started to like it. 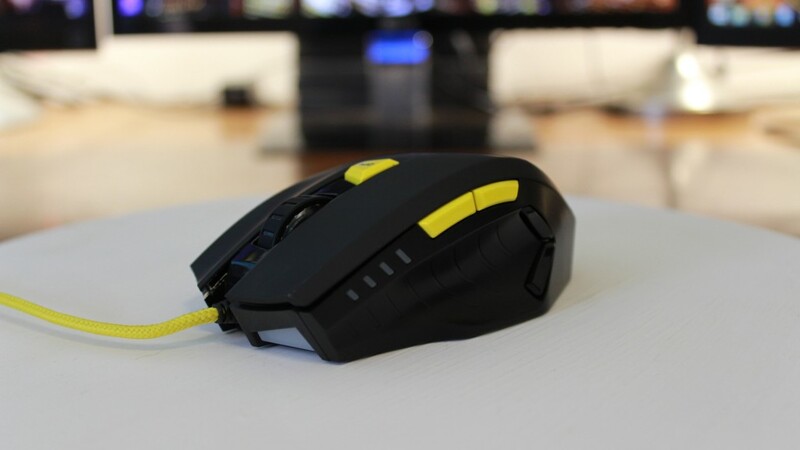 It has a lot of cool features like the 4 mouse buttons, the right-right mouse button and the hood popping weight bay. Overall the mouse just feels very comfortable, my thumb and my ring finger had a resting place and my pinky didn’t drag around on the ground. It was always fixed to the side and never had any problems. Honestly I can’t say anything bad about this mouse. It’s a small mouse so I can’t really compare it to my Razer DeathAdder. All I can say is what extra features would make the mouse even cooler. If Sharkoon could make a wireless RGB version of the M20 I would go buy it in a heartbeat, but that’s highly un-likely. So if you like smaller mice this is will be a great mouse for you.